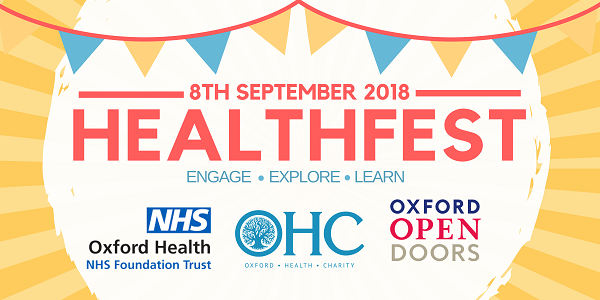 As part of our continuing NHS70 celebrations, we’ll be officially launching the Oxford Health charity at our first ever ‘Healthfest’, at the Warneford Hospital on 8 September 2018. The event is part of Oxford Open Doors, an annual series of events which allows the public to catch a behind-the-scenes glimpse of Oxford’s many historic and unusual locations. Come and find out more about our partners’ services, and get more involved with a historic hospital that’s been part of Oxford since 1826. Visitors will have the opportunity to wander through the halls of our 19th Century buildings, on the front lawn and down through the Warneford Meadow – one of the few remaining natural spaces in Oxford that provide a therapeutic environment for patients, staff and local residents. Stuart Bell, Chief Executive at Oxford Health, said: “I hope everyone takes this opportunity to visit the beautiful grounds of the Warneford Hospital to interact with our services, and find out about how we can support their mental and physical health and celebrate the progression and achievements that have been made since the NHS was founded back in 1948. Kerry Rogers, Director of Corporate Services, said: “We are using this event as an opportunity to officially launch the trust’s Oxford Health Charity. This charity is important to the care we provide, and any funds raised on the day will go towards improving service user’s experiences. You can find out more about the charity and how our volunteers make a real difference to the lives of those we care for on the day, or have a look at our volunteering opportunities. We will be showcasing art made by our patients, and there will be a variety of health and wellbeing stalls with activities, music and talks from local organisations, such as Dogs for Good (who provide assistance dogs to people living with disabilities). We are looking for volunteers to support the event and bring our NHS70 celebrations to a close: get in touch if you want to find out more about your local hospital and get involved with your community, by emailing NHS70@oxfordhealth.nhs.uk.